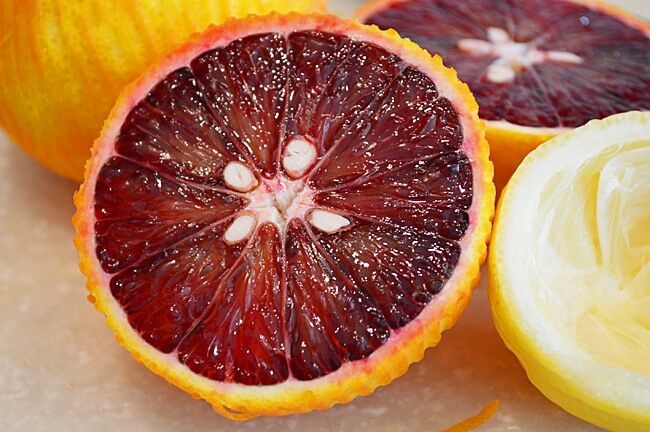 Named for the almost blood-colored juice they produce, blood oranges have two peak seasons. The darker fleshed Moro Orange is the newest variety, producing the darkest of juices. The anthocyanins which give the orange its distinct crimson color will only develop when temperatures are low at night, as during the Mediterranean fall and winter. Blood oranges cultivated in the United States are in season from December to March (Texas), and from November to May (California). While all oranges are likely of hybrid origin between the pomelo and the tangerine, blood oranges originated as a mutation of the sweet orange. They have a thin, blushed orange skin that can range from pink to dark red. They have a sweet, tart taste that is almost berry-like. You’ll want to look for oranges that are firm to the touch and are heavy for their size. Blood oranges are generally slightly smaller than traditional oranges. They store longer in the refrigerator, up to two weeks, while only a few days on the counter. 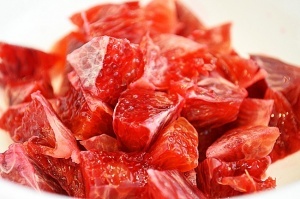 These red oranges are best eaten fresh, on a salad, used in marmalades. Just look at this red juice! Oranges have their health benefits! They are rich in antioxidants, including vitamin C, which aids in healing, boosts your immune system, helps your body absorb iron, and even helps reduce the risk of cancer. It is also a good source of fiber, which can help lower your cholesterol. Oranges can also be a good source of folate, calcium and thiamine. On their own, they contain no fat, sodium or cholesterol. To use just the orange segments, you’ll want to first peel the entire orange. Be sure to zest the peel first, you don’t want to waste that! 🙂 Using a sharp knife, make slices between the membranes to create the orange segments. 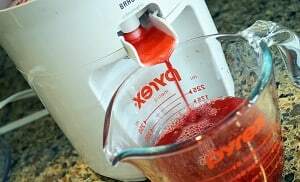 After cutting all of the segments, you can squeeze the remaining juice! 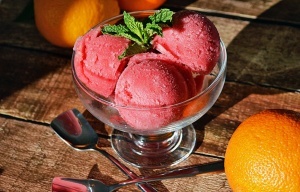 Check out our Blood Orange Sherbet recipe!